I've Landed My Dream Job--Now What??? - This book helps you think through what you need to accomplish from day 1 to 30. I've Landed My Dream Job--Now What??? In our shifting economy, landing a job –- any job –- is a big deal. So if you land your dream job, you may find yourself so pleased and satisfied with your achievement that you think you're done. 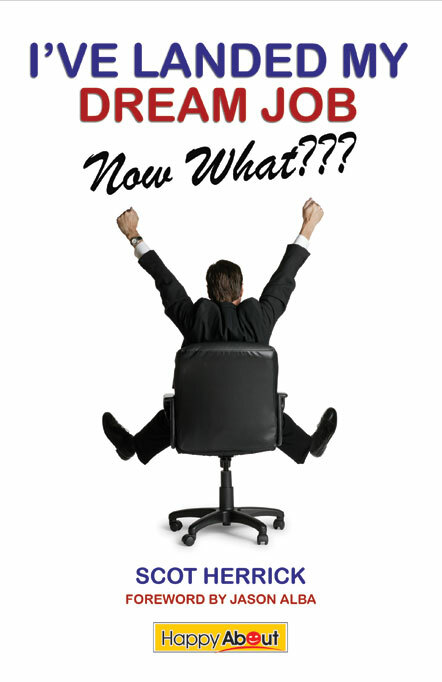 But, as Scot Herrick points out in 'I've Landed My Dream Job–-Now What???' today –- more than ever before –- you need to hit the ground running on day one of your new job. Given current economics, having a new employee get productive super fast is a huge advantage not only for the employee's manager but for the employee too. This can make the first 30 days at a new job intense and filled with anxiety because virtually everything is new –- corporate culture, team dynamics, management styles, and more. It is difficult for you, as a new hire, to nail down what you know, who to ask, and which of your skills are most valued by your new organization. Scot Herrick's purpose in writing this book is to help people like you, who have just landed a job at a large or small corporation, to get started on the right foot. Beginning with the often-overlooked basics, Scot shows you how to manage the transition from your old job, to evaluate the fit between your new workplace and yourself, to identify the real decision makers, to integrate into your new team's culture and, most important, to determine which aspects of your new role are most meaningful to your manager, and therefore most closely linked to your job security and paycheck. 'I've Landed My Dream Job–-Now What???' is designed to be your constant companion during the first thirty days at your new job. It will help you think through what you're going to accomplish and how to measure your accomplishments, right from day 1 all the way to day 30. Weekly tasks and action items make sure you are on track and end-of-week reviews help you assess how closely you are meeting your goals. With Scot Herrick's book at your side, you can be sure to survive and thrive in your new cubicle. Scot Herrick, founder and owner of Cube Rules, LLC, provides online career management training for Cubicle Warriors, his catchy term for today's knowledge workers. Scot has a long history of managerial and individual contribution in Fortune 100 corporations. He has implemented individual products for customers and enterprise-wide customer relationship management systems. At CubeRules.com, Scot shares his wisdom and experience to provide career management guidance for all cubicle warriors, to survive and thrive in these turbulent times.